Picture unrelated. Why? 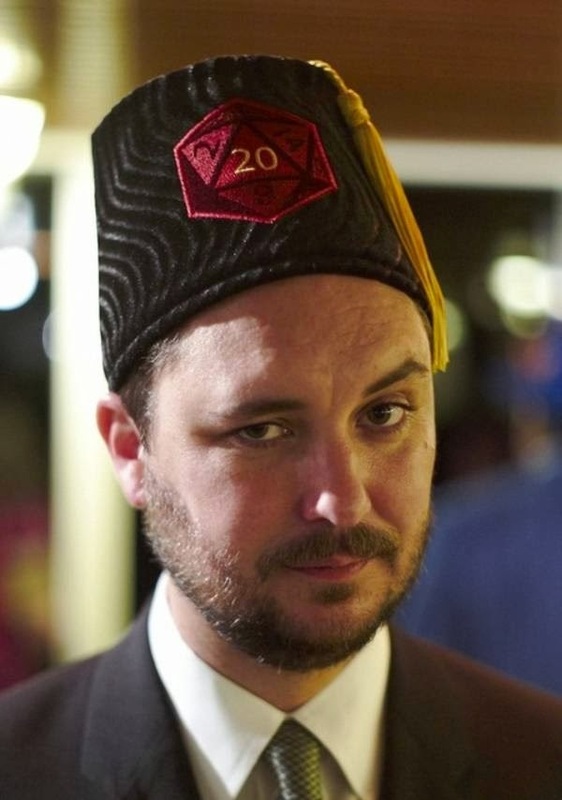 Will Wheaton in a d20-fez, that's why. I originally started this blog to have a way to preserve and share game-relevant information with my players. When the original chronicle ended it was perhaps also inevitable that the blog went into (a somewhat fitful) hibernation. Now that we've started up again the blog has also been resurrected. This time however, it is but one of the tools in the box. The biggest change from earlier is of course the trivial question of the 7,000 clicks between me and the rest of the group. Google Hangouts solved this better than I think any of us expected. We still haven't played enough for us to have mastered this medium, so I'll return to that in time. For now I'll say that I'll run a Hangout game any day. The next big change is G+, more to the point its community-feature. In my humble, this is way better than Facebook's groups, in that the communities allows for sub-forums. So far I've been posting plot-hooks and NPC-vignettes, each with its own sub-forum. The NPC category allows for me to slowly populate the world with characters, without each being seen as a red herring. Once they are introduced, they are available if they become relevant. The plot-hooks serve a different function. First off all, it takes me very little time to post a paragraph or two about a potential story-seed. The players then get to pick and choose, ask questions, or do some off screen research into the ones they like. This saves a lot of time, and seeing as we now have less face-time, this should speed up the play. The last addition to my kit is Pintrest. I've always used images as a vital part of my prep-work, a staging area if you will. In the days of yore this meant thousands of images stashed away on my hard-disk - now this database too is accessible to my players. I believe this further opens up the world, in that places and characters are given names, and it should help us have similar visual references in mind when we sit down to play. Further, so far one of the players have started his own pintrest-board with Argos references. The G+ community and the Pintrest board together helps open up the sandbox. Not the hex-crawl type that draws on a compendium of encounter-tables, but a social one where the group cherry-picks their missions and destinations, and where they can approach and refer to NPC's not expressly mentioned in play. Despite these new tools, my old leather-bound notebook and fountain pen still play a vital role. That's where I write down the eyes-only stuff.